Join and be part of a global organization, which believes that everyone is entitled to a life of dignity and opportunity and works with poor communities, local partner organizations, volunteers and supporters to turn this into reality. Share your commitment and skills with us, and we will offer you a dynamic working environment, a competitive benefits package, and an opportunity to develop a professional career in one of the world's leading international development and campaigning organization. All the positions will be fixed term contract based in Kathmandu. Requirements: MBA, Master's degree in Finance or relevant subject. 5 years of work experience; with at least 3 years experience in enterprise, market-based or value chain development projects; or similar private sector positions (eg. Food companies, investment or similar). 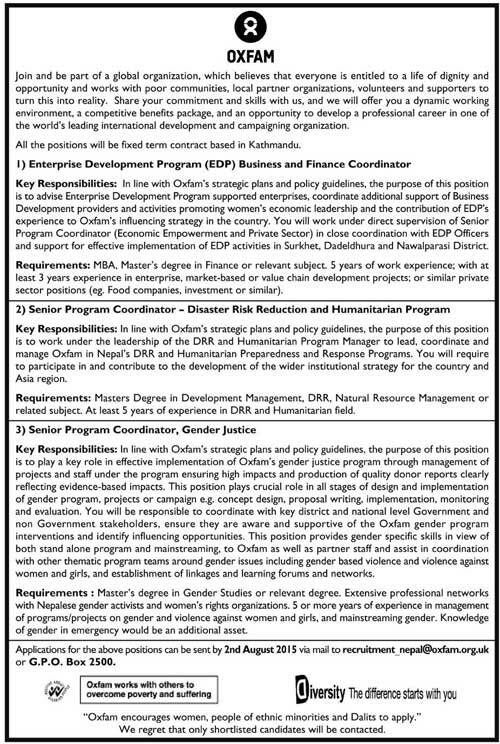 Requirements: Masters Degree in Development Management, DRR, Natural Resource Management or related subject. At least 5 years of experience in DRR and Humanitarian field. Requirements : Master's degree in Gender Studies or relevant degree. Extensive professional networks with Nepalese gender activists and women's rights organizations. 5 or more years of experience in management of programs/projects on gender and violence against women and girls, and mainstreaming gender. Knowledge of gender in emergency would be an additional asset.